Pyrolysis / thermolysis is the chemical decomposition of organic materials by heating in the absence of oxygen or any other reagents, except possibly steam. Tyre/plastic pyrolysis process refers to turning waste tyre/plastic into useful resources, such as fuel oil, carbon black, steel wire, etc. The green technology has been proved to be the most ideal method to deal with waste tyres pollution. (1) Put the waste tyre/plastic into reactor and make reactor rotate clockwise 0.4-0.8 r/min. Seal the feeding inlet door tightly and make sure there is no gas leakage. (4) The oil gas coming out from the reactor then goes to condensing system and become liquid oil. The gas which can't be liquefied under normal pressure will be designed to go back to combustion system through safety device. It can be recycled to heat the reactor as fuel, which will save energy for the whole working process. 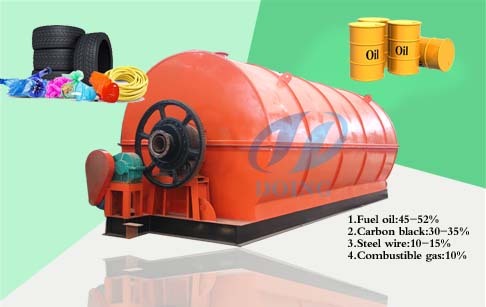 (5） After finishing oil production, the temperature of pyrolysis reactor will fall down, when the temperature falls down to 40 degrees Celsius, we can get carbon black and steel wire. If you wanna to get more details about Pyrolysis process description ? you can send E-mail to market@doinggroup.com. You can consult our professional engineer and specialized sales team with leave a message in below form.We will contact with you ASAP.You also can visit our factory in Henan,China.Get Detailed address.